Chair for a master ST-14, buy at the price of 80 in Europe. The company "European medical systems" presents the chair for a master ST-14 for the cosmetologist with rigidly fixed backrest. The product is made in Taiwan and has a number of favorable characteristics. 1. The base is made of chromed metal. 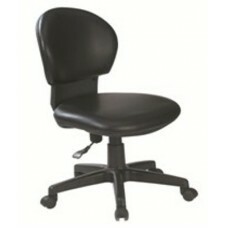 The seat and a backrest are covered with imitation leather of excellent quality. Depending on the overall color scheme of the interior, you can choose burgundy, beige and brown or beige upholstery. Plastic edging of a backrest gives the chair a special design elegance. 2. Height is adjustable up to 58 cm by means of a hydraulic pump. Chair for a master ST-14 is mobile due to easy spinning wheels, allowing the master to move from the client to the hardware and back quickly. 3. Care is not a problem: it can be cleaned with a neutral detergent by any means.